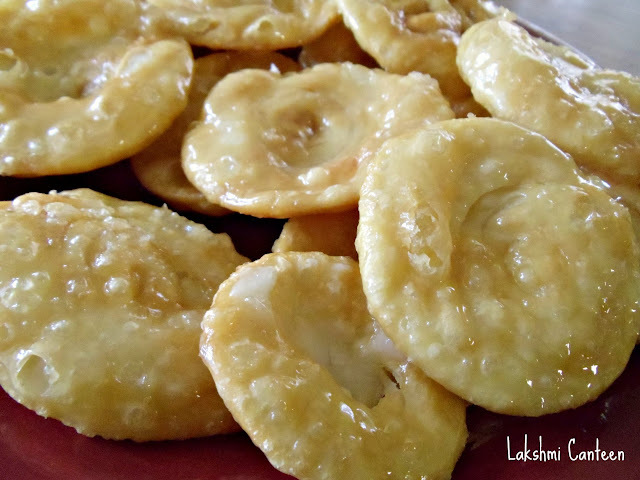 Phenori or sweet pooris is one of my favorite sweet (I keep on telling this for almost every sweet!!). This sweet is a layered poori (call it mini parota) which is either dipped in sugar syrup or sprinkled with powdered sugar. It has been a long time since I ate it but never tried making them. My Amma used to make this for us when we were kids. The method she followed was little lengthy (You can find this method in Divya Kudva's Easy cooking). So I was searching for an easier method and found it finally in Vahrevah.com. Sanjay is an excellent chef. 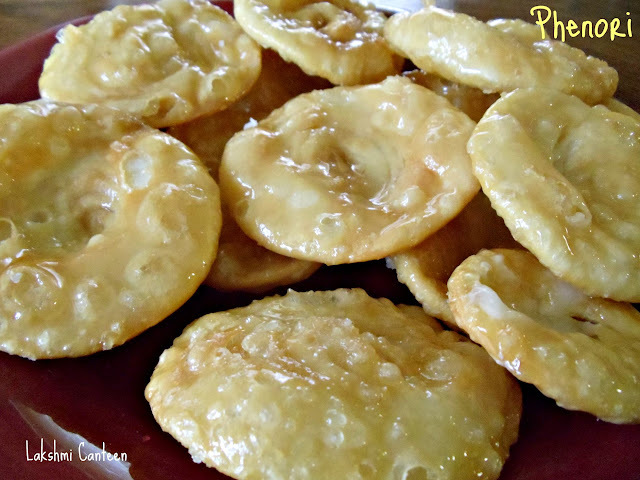 Using his recipe and tips, I made these phenoris and the result was heavenly. It was so tasty and addictive that I ate three phenoris as soon as it was done!! Fresh phenoris are so tasty. 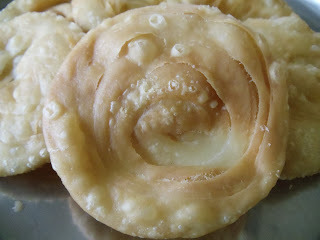 Try making this wonderful sweet and impress your loved ones. Take all purpose flour and salt in a mixing bowl. To this add melted ghee and mix well. Now add water (as required) and make a medium soft dough. 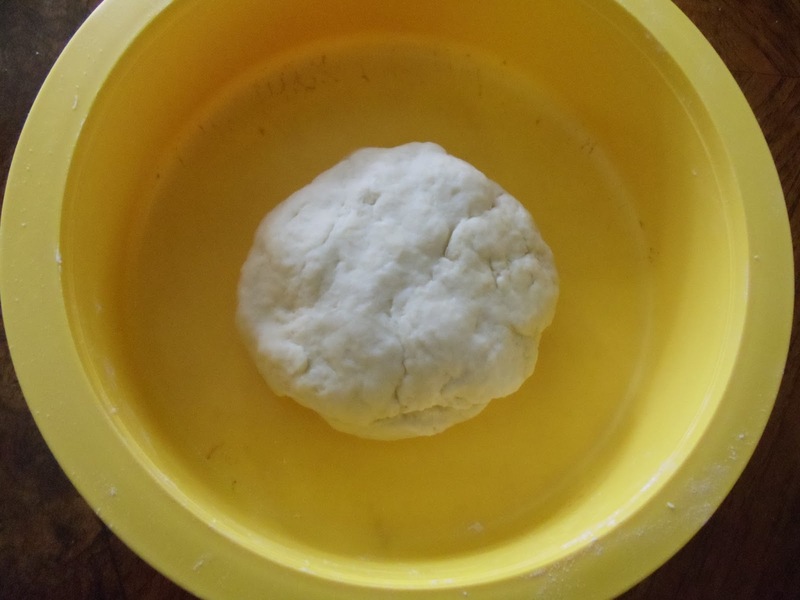 Divide the dough into two parts. 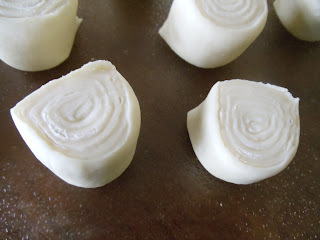 Take one part of the dough and start rolling it. Make it as thin as possible. Now make a paste of rice flour paste by mixing rice flour and ghee. Add water if required. 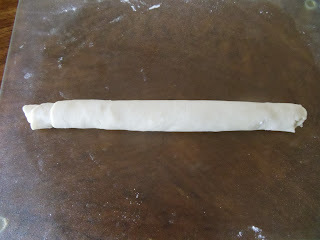 Start spreading a portion of the paste on the rolled dough. Applying this paste helps to get well separated layers in the poori. 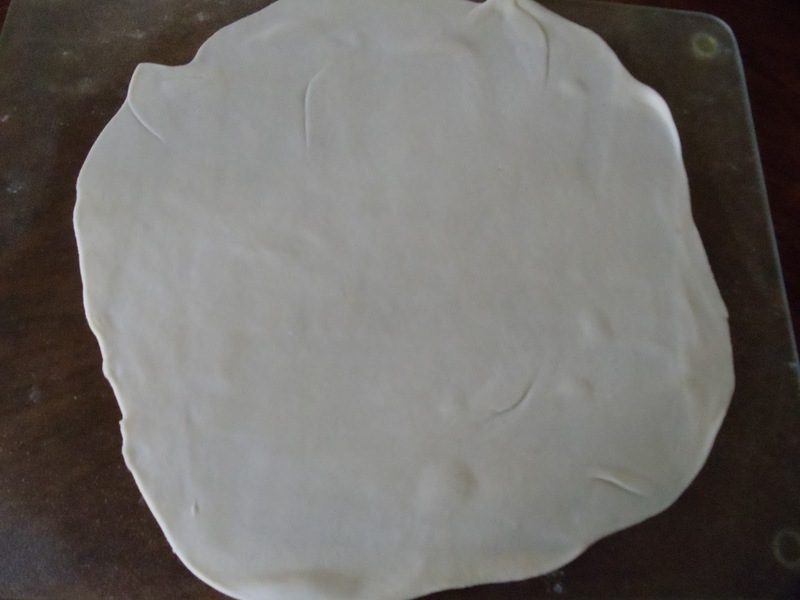 Once this is done, start rolling the big chapathi from one end to get a tight roll. 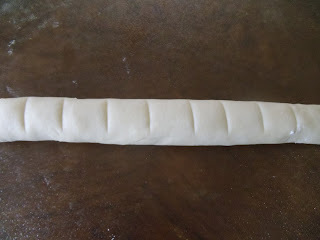 Now once this is done, start marking on the roll with the help of a knife (roughly 1-2cm). 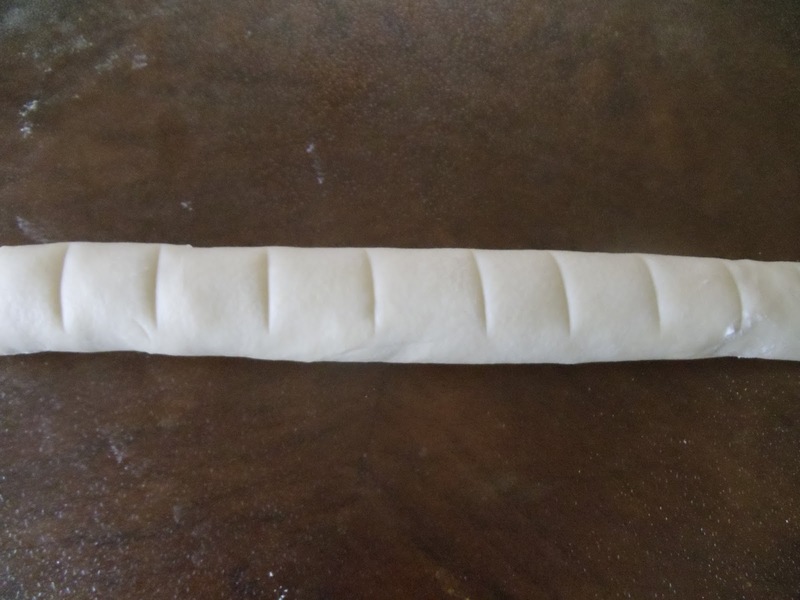 Now start cutting the roll with a knife according to the marks made on the roll. Look at those small pieces with the hidden layers. How pretty!! 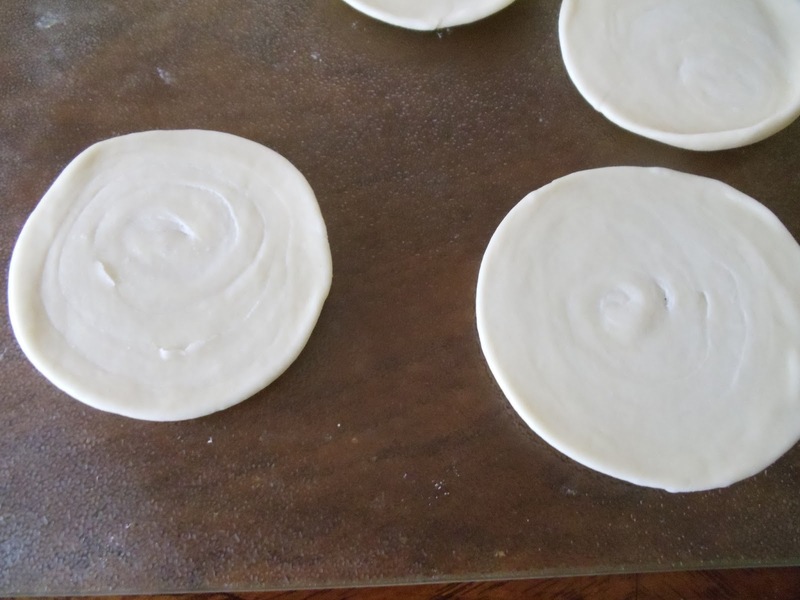 Now take one piece and start rolling it into small pooris (you should roll it on the side, where you can see the layers). "What happens if you make it big?" As you make it bigger the layers will vanish. This is not a good sign. "What if by mistake, i roll it bigger?" 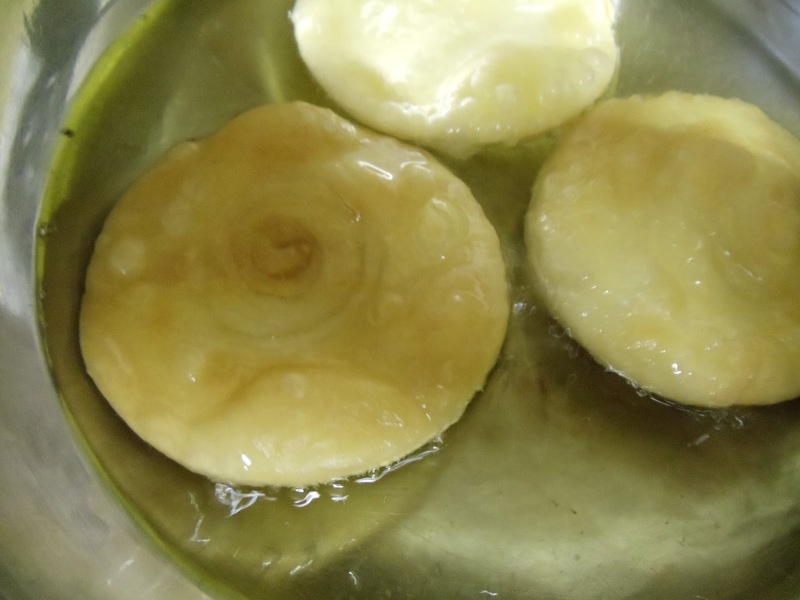 Still you can make good sweet pooris out of it. So don't worry. 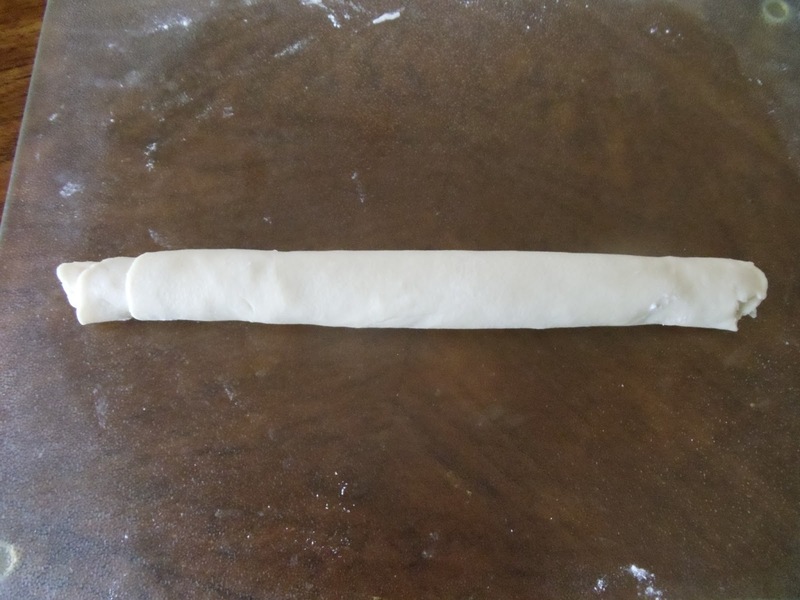 This mistake will surely give you an idea as to what size it has to be rolled:-) One important step has been accomplished. The next important step is to deep fry these pooris. The pooris has to be deep fried on a medium heat or a little less than that, until it turns light brown color on both sides. If the heat is high, then you will not get crispy pooris. Once it is done, drain the excess oil on a paper towel. Now the pooris are ready!! 75% of the work is done!! Now to prepare the sugar syrup- Add sugar to a wide bottomed kadai and start heating. To this add little water (nearly 1/4 cup). This helps in dissolving the sugar. Heat it until you get one thread consistency. Turn off the heat. Now start dipping the pooris one by one to get a sugar syrup coating on both the sides. 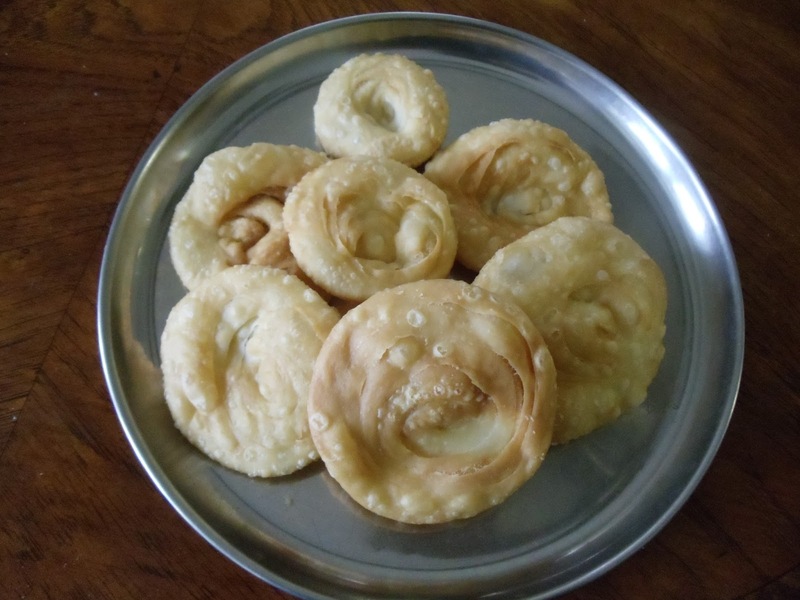 Put the pooris on a plate and leave them to set for half an hour (if you have a sweet tooth, i am sure you can't wait for half an hour:-)) Phenoris are ready!! Are you drooling over the picture?!! Then make them today and enjoy. Above measurement can serve around 10-12 people. i came across your blog while searching recipe for sanjeera.i love the way you have pictures to guide the reader while cooking and the way you explain away each and every doubt one might have while following your recipe. Being a konkani and a konkani food fan myself seeing all these recipes here make me feel like a i have discovered a treasure. Keep up the great work. Thanks a lot Shruthi, for the encouraging words. You made my day !